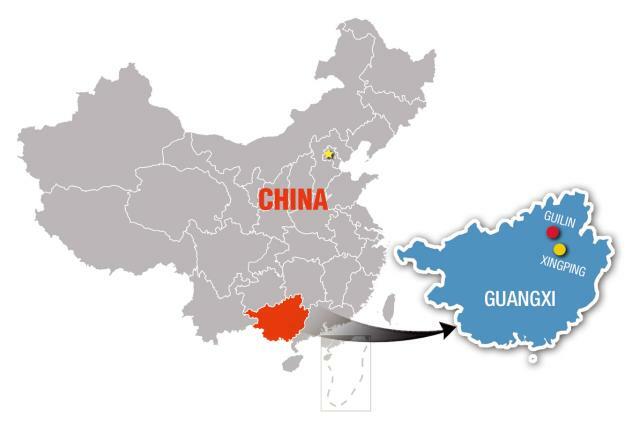 For decades, the Guangxi Zhuang Autonomous Region has been a favorite destination for international and domestic travelers. The beauty of the region’s distinctive limestone karst peaks is very much appreciated, and even graces the country’s 20 yuan note. Even now, Guangxi has not lost its flavor. Since 2014, the region has been connected to high-speed rail lines which means that traveling to Guilin and nearby beauty spots is easier than ever. 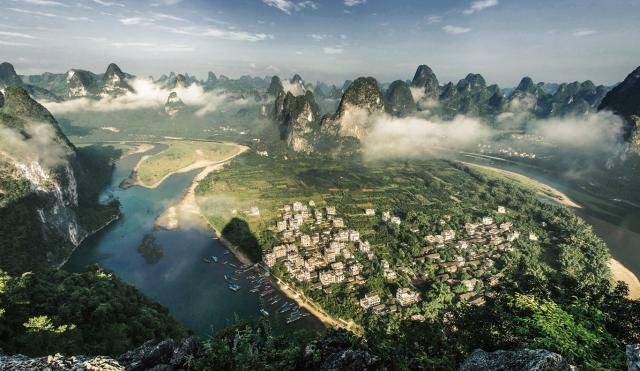 While Guilin is the most famous city in Guangxi for tourists, the smaller town of Yangshuo is a more picturesque and impressive place to view karst peaks. But even Yangshuo has become built up and commercialized, with parts of it resembling a booming town rather than a rural community. Besides Yangshuo, nearby villages like Xingping, where the Yangshuo high-speed rail station is actually located, provide a more laid-back and rural experience. 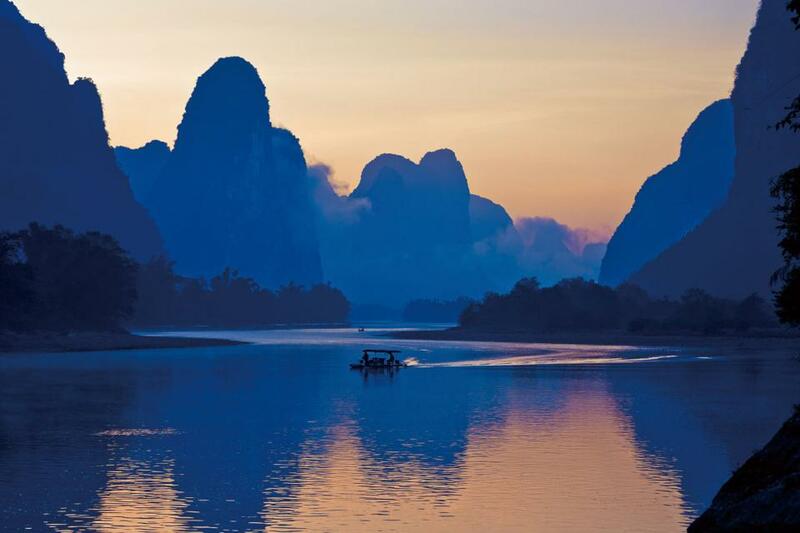 Guilin is where most visitors start their travels to the region. You won’t need to go far to see karst peaks because the city is surrounded by them. There are several scenic parks and gardens within the city that feature hills, small lakes and pagodas. Just outside the city, there are famous spots like Elephant Trunk Hill, so called because the hollowed part where it meets the water resembles an elephant trunk, and Reed Flute Cave, where colorful lights illuminate striking stalagmites and stalactites. Despite Guilin’s beauty, you can’t fully appreciate the region’s natural charm without proceeding along the Li River to Yangshuo. Cruises are very popular, and long flotillas of boats make the journey every day from a dock some 45 minutes outside Guilin. The riverbanks are studded with dozens of karst peaks as well as villages and farms that really make you feel as if you are in a different world from the megacities in the rest of China. When you reach Yangshuo, you are quickly reintroduced to the real world. While Yangshuo is also ringed by lovely karst hills, its town center, especially West Street, is dominated by hotels, restaurants, and shops. In the evenings, West Street is thronged with visitors, with loud music playing from storefronts, and lights soaring into the sky from a mall with a small lake in the middle. While this might appeal to some people, it is a little disappointing and not what I came to Guangxi for. To me, what makes Yangshuo great to visit are its many hills, caves and the riverside scenery on the outskirts. A trip along the Ten Mile Gallery – a road from Yangshuo that ends at Moon Hill – takes you over a river, through numerous hills on both sides of the road, as well as farms and some well-known natural sites. The only drawback is you may get accosted by touts trying to get you to purchase tours or tickets through them. One such tout, a plucky lady, actually rode her e-bike alongside me as I cycled on the road, badgering me to buy tickets from her. The more insistent she got, the less interested I was in her offer, so I eventually refused and she rode off in a huff. One of the best sites to visit is Moon Hill, so called because the 230-meter hill features a huge circular space near its peak. It’s a mild hike to get to the top, where you can enjoy sweeping vistas of the countryside below. Another “must-see” is the “Big Banyan Tree,” which as its name says, is indeed quite large, but it has supposedly been around for over 1,400 years. Besides visiting these sites, there are a ton of activities to do. You can do some rock climbing on the karst hills, including Moon Hill, cycle around the country roads, or take a ride on a bamboo raft on the river. I even spotted a small helicopter in a field off the side of the road which I assumed was used for sightseeing. Yangshuo is full of small agencies that organize rock climbing and other activities so just check with them or your hotel if you are interested. Further upstream on the Li River, Xingping is a fantastic little village between Yangshuo and Guilin that offers a quieter and serene alternative. Like Yangshuo, you can also hike or go on boats on the river. The first place to hike is in the village itself, as Laozhai Hill provides great views of Xingping and the surrounding area, as well as the river as it flows alongside the village. At 300 meters, Laozhai Hill is not high, but some of the stone steps along the trail to climb up are a little steep, so do be careful. The famous view of karst peaks along a river on the 20 yuan note is actually near Xingping, reachable by a 15-20 minute walk upstream along the river. A lot of people like to take a photo of the view while holding up a note, which I did as well. You can also hire a boat to take you further upstream to view numerous picturesque hills, often named after their distinctive physical attributes, and visit Yangdi, another village similar to Xingping. Some people have even trekked from Xingping to Yangdi or vice versa, though you will need to get on a boat to cross the river at several points. Near Xingping, there are even tinier villages as well. I chose to hike to Yucun or Fishing Village, which is only accessible by trekking through the hills or by river raft. It is indeed rare nowadays, especially in China, to visit a place that is not connected by roads. After a two-hour hike that passed through orange groves and valleys, I reached Yucun and was given a short tour by a local woman who kindly showed me around and pointed out distinctive features of older buildings such as wooden carvings of mythical creatures. Built in the 16th century during the Ming Dynasty (1368-1644), Yucun is very small, but it has had special visitors. It was visited by none other than former US president Bill Clinton as well as first lady Hillary and daughter Chelsea in 1998 during Clinton’s state visit to China. Going back further to 1921, former Chinese leader Sun Yat-sen also visited Yucun. However, whether you visit Yangshuo or Xingping, make sure to rent a bicycle and explore the surrounding countryside. Even if you don’t visit the sites mentioned here, there are numerous other villages, farms and hills to explore. Every visitor to China who loves nature should come to Guangxi if they have the chance. After all, even Bill and Hillary Clinton did.